The news of Baha’u’llah’s banishment swept through Baghdad like a sandstorm. The Babi community gathered around, greatly distressed at the thought of the heart of their community—Baha’u’llah—leaving them. Baha’u’llah’s home was too small for all the visitors who crowded in to see him one more time. Plus, the constant stream of visitors put an added burden on Baha’u’llah’s wife Navvab as she tried to pack and prepare for the journey. A prominent man of Baghdad offered his private garden outside of town as a place where Baha’u’llah could meet with visitors. This park-like garden on the banks of the Tigris River, later called the Garden of Ridvan (which means “Paradise;” and is pronounced Rez-ván) by Baha’u’llah’s followers, would become one of the holiest and most revered places in the Baha’i world—the spot where the Baha’i Faith began. On April 22, 1863, Baha’u’llah left his house in Baghdad for the last time, walking toward the river that he would cross on his way to the Ridvan garden. Observers remembered an emotional and memorable scene. People packed the streets. Some climbed up on the rooftops to get one last look at Baha’u’llah. In the center of this whirlwind the calm figure of Baha’u’llah strode smiling through the crowds. His followers gathered in the Garden of Ridvan, outside the gates of Baghdad, for twelve days. Although Baha’u’llah had not yet shared with anyone the nature of his transforming experience in the Black Pit of Tehran ten years earlier, many had recognized his prophetic station on their own. They saw this rare quality in the spontaneous outpouring of his powerful speech and writing, which seemed to come from an innate and superior wisdom, in his calm dignity in the face of either praise from notables or assassination attempts by enemies, and in the deep spiritual resonance they felt in his presence, a radiant love that inspired them towards the highest standards of morality and kindness. Now, in that garden redolent of the fragrance of roses and filled with the spring song of nightingales, Baha’u’llah announced the nature of his mission to a few followers. The announcement caused great joy to those who had already sensed it, and a renewed sense of purpose to the exiles. 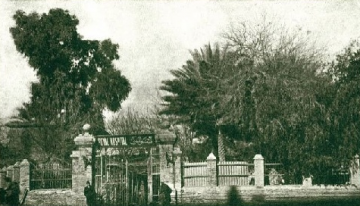 Entrance to the Garden of Ridvan in Baghdad. Every morning in the Ridvan Garden, the gardeners picked roses and piled them in the center of Baha’u’llah’s tent. In gestures of friendship, Baha’u’llah would give a rose to each visitor, and others to be taken to his friends and followers in Baghdad. Say, by the righteousness of God! The All-Merciful is come invested with power and sovereignty. Through His power the foundations of religions have quaked and the Nightingale of Utterance hath warbled its melody upon the highest branch of true understanding. Verily, He Who was hidden in the knowledge of God and is mentioned in the Holy Scriptures hath appeared. 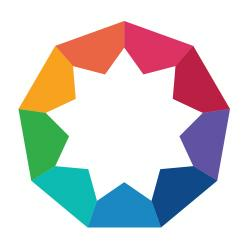 – Baha’u’llah, Tablets of Baha’u’llah, p. 107. In Baha’u’llah’s beautiful, poetic, elevated language, the conscience that a new global Faith had dawned began to shine on the small band of Baha’u’llah’s enthralled followers.